There is a 'lemon and lime' look to this ground-hugging member of the Primrose Family. 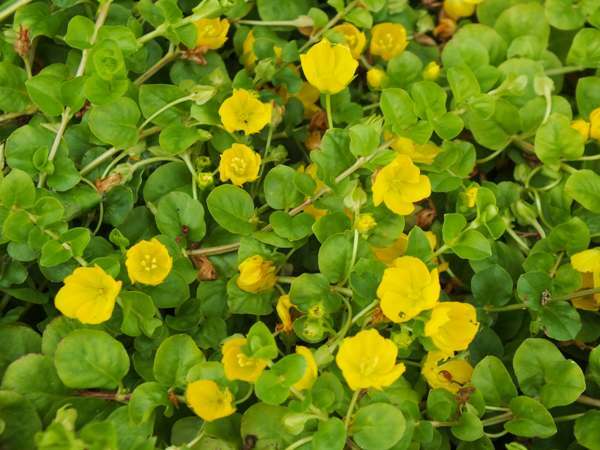 A hairless low-growing perennial creeper, Lysimachia nummularia has five-petalled yellow flowers that are typically 2cm across and shaped like cups. Another distinguishing feature is its bright green rounded heart-shaped opposite leaves. Like other creepers, this wildflower propagates by seed and via runners that root at nodes. Native to Britain and Ireland, where it is most common in the south, Creeping Jenny is only an occasional find in the north of England and Scotland. There is a cultivated variety of Creeping Jenny that has escaped from gardens and now appears quite frequently in the countryside, notably near to towns and villages; the cultivar produces many more flowers than the wild plant, and so the more flowers that Creeping Jenny plants have the more likely it is that they are garden escapes rather than truly wild plants. Creeping Jenny is widespread throughout northern and central Europe; we have seen it in many parts of France, Slovenia and Bulgaria. In the wild Creeping Jenny is found in damp grassy places nearly always away from bright sunlight. 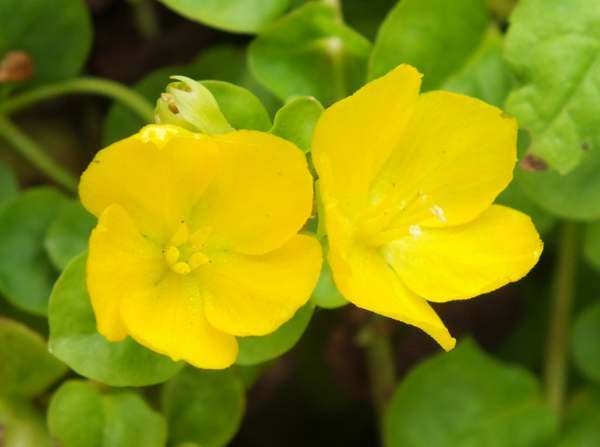 In Britain and Ireland the first yellow flowers of Creeping Jenny appear in May, and blooming usually continues until mid August. Herbalists find this plant useful, and they have done for many centuries. In the 1600s Culpeper, referring to Creeping Jenny as 'Moneywort' and recommended it in particular for treating stomachs that were 'given to casting' - vomiting, in other words. The specific epithet nummularia comes from the Latin nummularius via nummulus, the diminutive of nummus, and meaning a small coin - hence nummularia means shaped like a small coin. 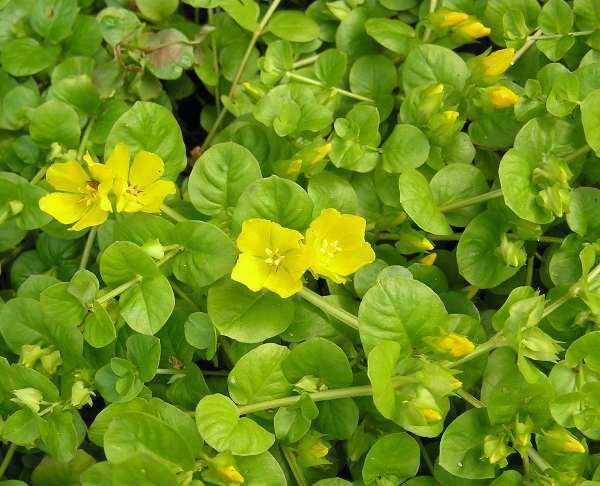 Creeping Jenny is a close relative of Yellow Pimpernel, which has narrower leaves and smaller flowers with much more pointed petals. The Lysimachia nummularia plants shown on this page were photographed in West Wales in July and August.